I’ve always been the kind of person to do things a little bit differently. I have to push societal norms to their limits and carve my own way in life. For example, I haven’t worked at a conventional job in over 14 years, and I don’t plan on doing it again. Many people are shocked when I tell them that I am self-employed because it’s the norm to work for someone else. Last year, just before my 35th birthday, I dyed my hair deep purple. You better believe that I rocked that purple hair at my kids’ events and even at church. I’m also unconventional in my daily hair care. 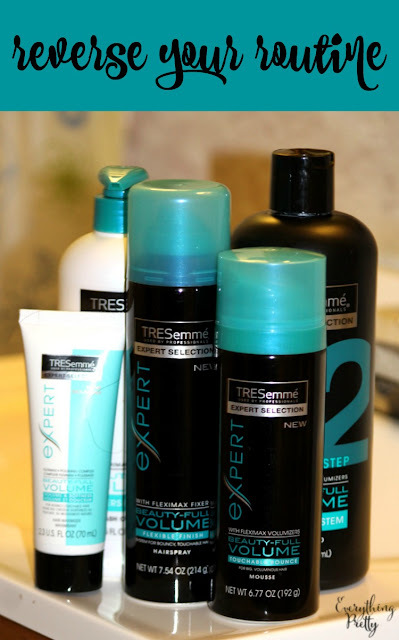 Thanks to TRESemmé, I use conditioner before I use shampoo. I know, right? It’s unheard of! Traditionally, you’d wash your hair and then apply conditioner, letting it sit for a few minutes before you rinse. This gives the conditioner enough time to make your hair feel softer and look better, but it can also leave a residue behind. TRESemmé has specially formulated the Beauty-Full Volume collection to work in reverse! If you reverse the process and use conditioner first, the shampoo will wash away the residue from the conditioner. That residue is what weighs down your hair and makes it look limp and lifeless. When you wash away the residue from the conditioner, you’ll have more volume. But there’s another benefit to reversing your routine: Conditioners are made with oils. Oil dissolves oil. So when you rinse out your conditioner, it will also rinse out some of the oil and dirt in your hair, so your shampoo will lather better. If your hair is long, you’ll probably even use less shampoo, too. The TRESemmé Beauty-Full Volume Body Collection is made especially for creating volume. Start with the Beauty-Full Volume Pre-Wash Conditioner to soften your hair. Follow with the TRESemmé Beauty-Full Volume Shampoo to gently cleanse and remove extra weight from your hair. Use the TRESemmé Beauty-Full Volume Hair Maximizer or the TRESemmé Beauty Full Volume Touchable Bounce Mousse to boost volume. Finish with the TRESemmé Beauty-Full Volume Flexible Finish Hairspray to finish your hair style. It gives you a long-lasting hold, yet it’s brushable for manageable hair. bleached highlights, my hair can really take some abuse. The reverse routine with the TRESemmé Beauty-Full Volume Collection has really made a difference in my hair. It’s shinier, has more volume, and it feels so soft. Are you ready to break the conventional rules and condition before you wash? Visit TRESemmé to learn more!